Several videos making reference to Clausewitz are listed below, some of which have actual educational value. Others are merely amusing (or not even that). They are listed in no particular order of importance. There are also several videos on Chaos and/or Complexity on our page "Illustrations of Chaotic Systems," though (other than the ROMP, which Clausewitz used to illustrate his "fascinating trinity") these have nothing specifically to do with Clausewitz. 1. 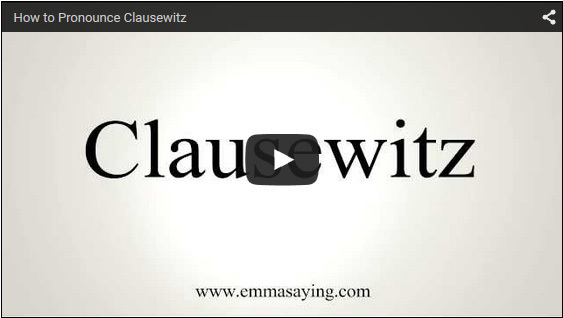 SAY CLAUSEWITZ'S NAME CORRECTLY. It will gratify some people and astound the rest. 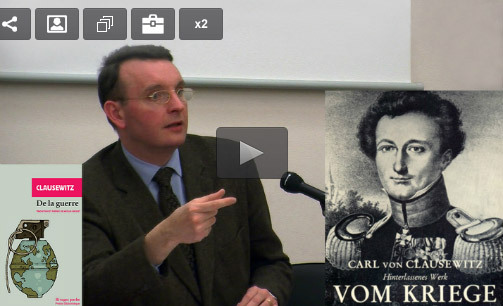 BTW: Use the 'von' (pronounced 'fun') only with the full name (i.e., "Carl von Clausewitz"). Do not use the von with his last name alone (e.g., don't say "We find value in von Clausewitz's theories"). Simply say you find value in Clausewitz's ideas. 2. Excerpt from film Crimson Tide (1995). The content is a little bit debatable (but we've never seen anything on Clausewitz that wasn't debatable) in the theoretical argument scene between Gene Hackman and Denzel Washington. I use it at the National War College as a prelude to seminar and it always sparks things off. You have to watch it closely—we think it's a valid analysis, but there are some tricks in it. For instance, Clausewitz does not argue that the commander who ignores the political issues is the one most likely to win, but he does make an argument in very similar language that the opponent who considers his objectives to be worth a higher price has an advantage—which was obviously the case in, say, Vietnam. 9. 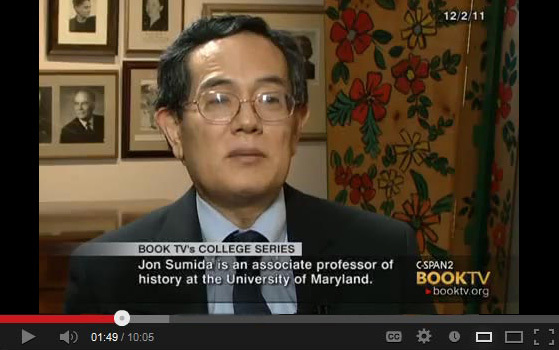 Interview with University of Maryland History Professor Jon Sumida about his important book, Decoding Clausewitz: A New Approach to On War (University Press of Kansas, 2008). (This YouTube version of this interesting video ends rather abruptly; the full video can be watched at http://www.c-span.org/video/?303077-2/book-discussion-decoding-clausewitz.) See also his short article "The Clausewitz Problem," Army History, Fall 2009, pp.17-21—a short, well-crafted, and useful précis of Sumida's important, sometimes controversial arguments. 10. CLAUSEWITZ AT THE PENTAGON, 2015. 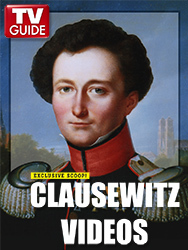 The Pentagon began running a speaker series on Clausewitz in September 2015, initiated by Under Secretary of Defense for Personnel and Readiness Brad R. Carson. Several speakers have been captured on video: These include H.R.McMaster, Jennie Kiesling, Alan Beyerchen, Antulio J. Echevarria II, Christopher Bassford, Jon Sumida, and Peter Paret. We will post them here if/as they become available. The final session of the series occurred on 11 DEC 2015 and involved all of the series' speakers in a panel discussion on the present relevance of Clausewitz. These video files have been optimized for reasonably easy downloading. We may be able to offer them in higher resolution—contact us if you need that. 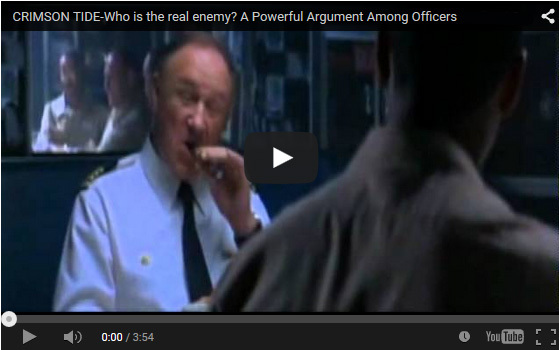 a. Dr. Eugenia Kiesling, USMA at West Point, 2 OCT 2015, speaking on "Who is Clausewitz?" (38 mins; no Q&A). d. Prof. Peter Paret, Institute for Advanced Study, Princeton, 10 DEC 2015, speaking on "On War, Then and Now." (59 mins). His talk is essentially identical to his article “On War Then and Now,” The Journal of Military History, 80:2 (April 2016), pp.477-85. 11. Donald Stoker | Clausewitz: His Life and Work. 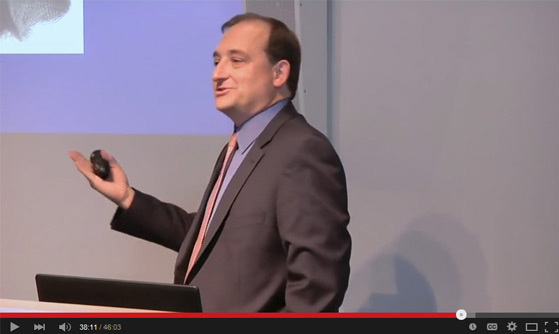 (YouTube video) Naval War College at NPS Professor Donald Stoker, speaking at Google on 17 NOV 2014, on Clausewitz the soldier behind the theorist. Stoker is the author of Clausewitz: His Life and Work (New York: Oxford University Press, 2014), ISBN: 0199357943. (YouTube video.) The Talks at Google program brings authors, innovators, scientists, actors, actresses, artists, filmmakers, musicians, and speakers of all kinds to Google for talks centering on their work. 12. 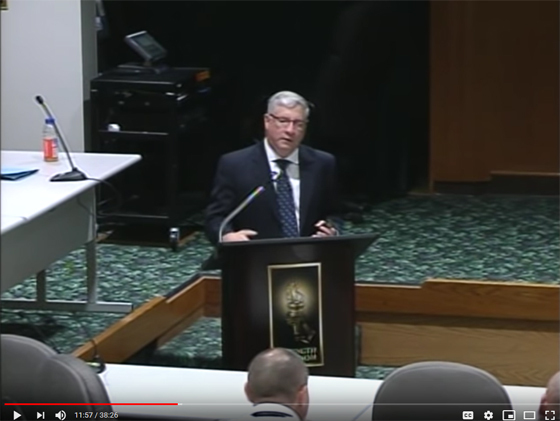 Dr. Jim Helis, chairman of the Department of National Security and Strategy, the Army War College, discusses Carl von Clausewitz during a lecture at the Army War College. This is pretty good, especially on Clausewitz's professional background. The discussion of Clausewitz's concepts is weakened by Helis's emphasis on unilateral "policy" (vice multilateral "politics"), which in our experience lends itself to a unilateralist, "engineering"-approach misinterpretation of Clausewitzian theory. He correctly identifies the elements of Clausewitz's "trinity"—a big plus. However, he misinterprets Clausewitz's skepticism of the accuracy of your typical tactical intelligence report to mean that "Clausewitz saw no value in intelligence." This is a common if inexplicable conclusion—thoroughly contradicted by Clausewitz's constant demand for careful study of all aspects of one's situation. 13. Dr. Antulio J. ("Tony") Echevarria II, Director of Research, US Army War College, presents "Clausewitz and Contemporary War," as part of the Perspectives in Military History Lecture Series. Tony is one of the leading American scholars on Clausewitz. Published 25 MAR 2010. 14. "Clausewitz Theory of War, Background and Trinity." Dr. Tony Echevarria, Army War College faculty, 29 AUG 2017. Carlisle Barracks Wil Washcoe Hall. 16. 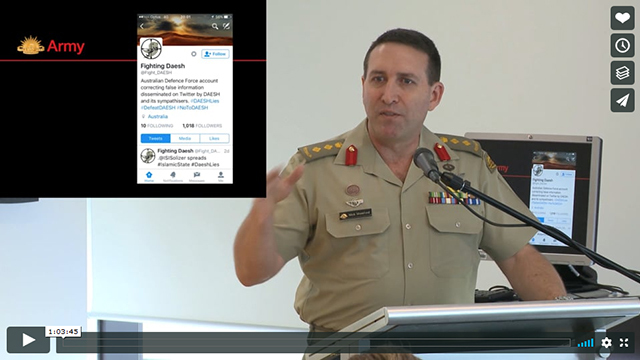 Colonel Mick Mumford (Australia), "Social Media and Clausewitz: Incorporating new technologies into an old ideology." 16 November 2015. 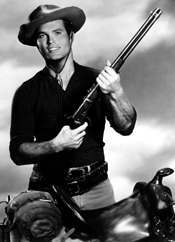 "Colonel Michael 'Mick' Mumford, CSC, is a graduate of the Australian Defence Force Academy and Royal Military College. In nearly 30 years of service he has commanded infantry soldiers at every level and his operational deployments include border protection in the Torres Strait, peace monitoring in Bougainville, election support in PNG, peacekeeping in Timor Leste, and active service in East Timor and Afghanistan. He is a Distinguished Graduate of the US Marine Corps' Command and Staff College and School of Advanced Warfighting and he holds the degrees of Bachelor of Arts, Master of Business Administration, Master of Military Studies, Master of Operational Studies, and Master of Divinity." Clausewitz.com's view: An interesting and useful discussion on its own terms, this is a fairly typical military-doctrinal view and use of Clausewitz. Clausewitz's book On War is explicitly not intended as doctrine, and in any case It would be a serious error to view Colonel Mumford's presentation as any sort of summary of Clausewitz's arguments. 17. COMBAT STUDIES INSTITUTE. "Lesson 4. Clausewitz and Jomini." 18. The Great Courses, "Masters of War: History's Greatest Strategic Thinkers. 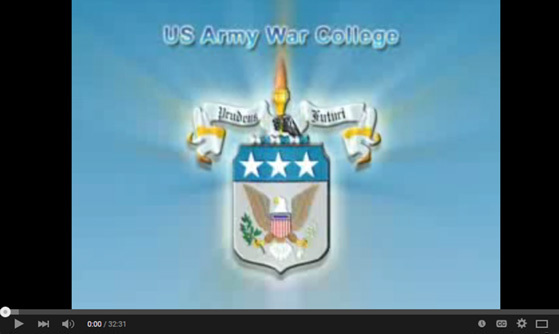 Lecture 10: Clausewitz's On War." Professor Andrew R. Wilson, formerly of Harvard and now at the U.S. Naval War College. (See course listing.) This is pretty good! We were alerted to this video by a prominent Clausewitz scholar who was critical of several features—especially Wilson's treatment of Clausewitz's trinity. We agree on that point and would quibble with Wilson on several others. 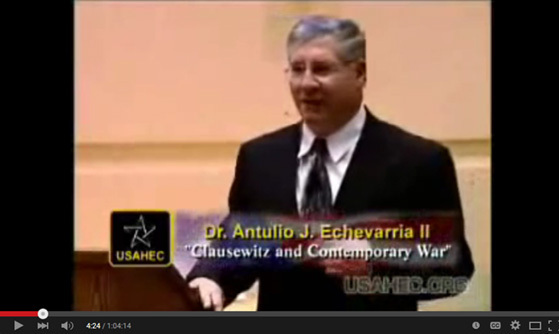 Nonetheless, this is probably the best general treatment of Clausewitz on video that we've seen. No longer posted to YouTube—try the "Great Courses" site. 19. The Great Courses, "Masters of War: History's Greatest Strategic Thinkers. 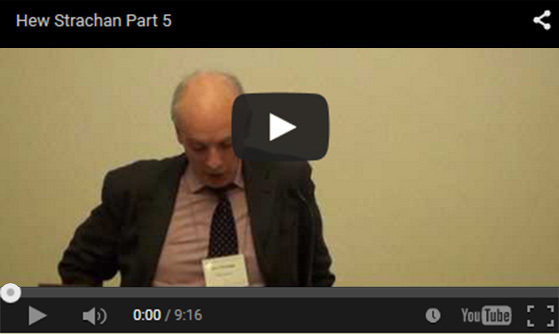 Lecture 11: "Jomini and Clausewitz through the Ages." Professor Andrew R. Wilson, formerly of Harvard and now at the U.S. Naval War College. (See course listing.) No longer posted to YouTube—try the "Great Courses" site. 20. 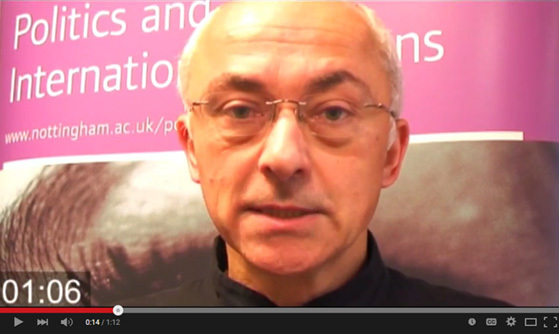 Professor Alex Danchev looks at Clausewitz as one of the great thinkers in politics. Covers the contents of On War in 60 seconds. Solid but inevitably a bit thin. a. "Clausewitz's Dialectical Method." (3:29) This video focuses on Clausewitz's rather formal dialectical discussion of the nature of war, rather than on the much more casual dialectical method that pervades the rest of his book On War. b. "Categories of War." (6:29) This video discusses the terms "Absolute (or Ideal) War," "Real War," "Limited War," and "Unlimited War." The term "unlimited war" was chosen for convenience and to avoid excessive "hair-splitting" in a pretty basic course. In retrospect, this was an error. Better terms (still not exactly Clausewitz's own phrasing) would be "war of limited objectives" and "war with the aim of rendering our opponent militarily helpless," but keep in mind that these phrases describe only one side's objectives in a war. The opponent's objectives may be quite different. These terms do not really describe "types" of war; rather, they describe types of political and military objectives. But the variety with which war manifests itself in the real world flows to a great degree from these distinctions. d. "Demonstration of Clausewitz's Trinity Imagery." (Randomly Oscillating Magnetic Pendulum). (2:32) Video #11 (above) gives a better view of the Romp in action but has no voice overlay describing what you're looking at. For a deeper explanation, see Christopher Bassford, "Tiptoe Through the Trinity, or, The Strange Persistance of Trinitarian Warfare." If you really want to go deep, read Alan D. Beyerchen's brilliant "Clausewitz, Nonlinearity and the Unpredictability of War," International Security, 17:3 (Winter, 1992), pp. 59-90. 22. Interview avec Raymond Aron sur Clausewitz—illustrations guerres (in French). IT1 NUIT - 16/02/1976 - 06min38s. Original URL. Interview avec RAYMOND ARON a propos du livre qu'il vient d'écrire sur Cclausewitz. Trace portrait de Clausewitz. Souligne l'actualité de ses idées sur la guerre. "Toute guerre est un caméléon." Suite int. De l'historien voix off sur images de guerre: conflit au Sahara occidental: Chars patrouillant dans Le Désert. [zoom arrière] canon de char. Soldat manoeuvrant char. Guerre en Angola: blesse transporte sur dos de soldat. Diff. Blesses avec pansements. Traversée d'une rivière. 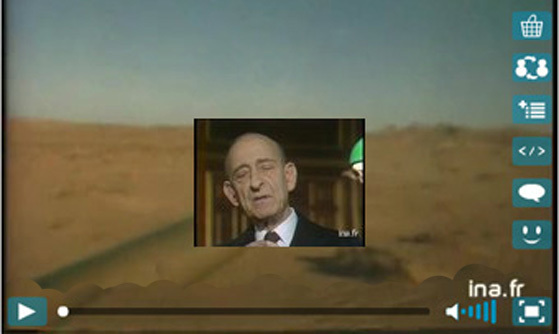 R. ARON parle des conflits. Actuels. images guerre en Israel. [gros plan] poste frontière. Soldats israéliens patrouillant sur camion militaire le long de la frontière. Combats vus a distance dans montagne. Guerre au Liban soldats patrouillant dans rue de Beyrouth. Soldat tirant depuis fenêtré immeubles incendies. Suite int. R. ARON sur les armes de dissuasion: "les batailles se livrent a un niveau sub nucléaire. Tout acte militaire est un acte politique. La guerre est toujours possible, mais est elle nécessaire? Je préférerais d'autres moyens pour résoudre les problèmes entre les états, mais on ne les a pas encore trouvés jusqu'à présent." 23. 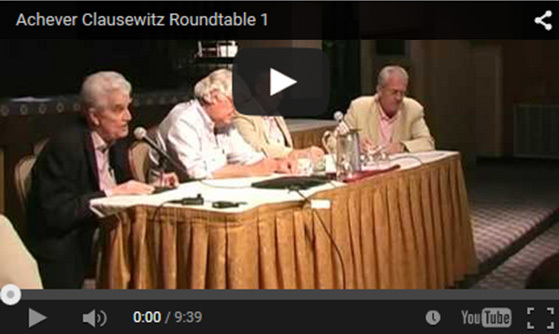 Achever Clausewitz Roundtable 1. 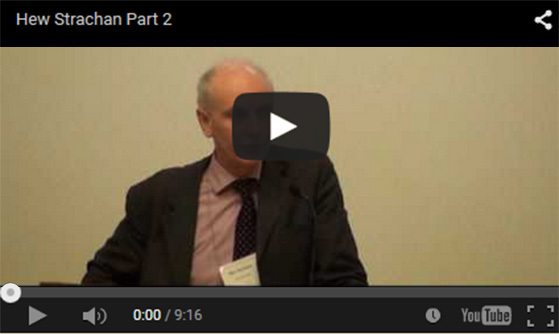 This is the first of a series of videos of a roundtable discussion (conducted in English) of René Girard's book Battling to the End: Conversations with Benoit Chantre, trans. Mary Baker (East Lansing: Michigan State University Press, 2010). [Original title: Achever Clausewitz, Paris: Carnets Nord, 2007.] The discussants include Girard himself. Girard (b.1923) is a famous French anthropological philosopher and literary critic who is incorporating an interpretation of Clausewitz into his own conceptual schemes. While this may be a serious exploration of the philosophical implications of Clausewitz's work, it will appear bizarre to many in the 'strategic studies' arena. 24. "La guerre selon Clausewitz (par Martin Motte)." 2 Février 2015 (112 mins). "Peu de penseurs de la guerre ont été aussi admirés et aussi attaqués que Clausewitz. Référence indépassable pour les uns, il est pour les autres le lointain responsable des guerres totales du XXe siècle, pour d'autres encore un auteur typique du système westphalien, donc anachronique à l'heure des nouvelles conflictualités. René Girard y a vu pour sa part le prophète angoissé d'une poussée de violence apocalyptique dont les horreurs du XXe siècle n'ont été qu'une pâle préfiguration, et dont l'hyperterrorisme précise aujourd'hui les contours. Seule certitude: Clausewitz continue à nourrir le débat stratégique. Comment? Pourquoi?" 25. 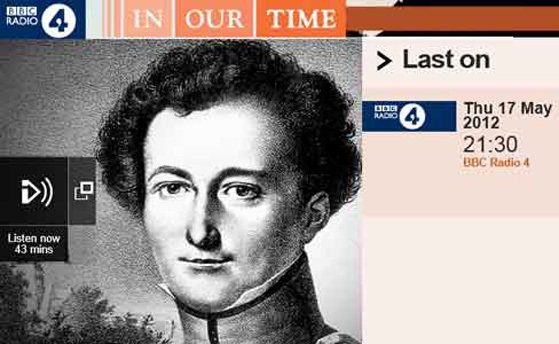 BBC Radio 4, "In Our Time," Thursday 17 May 2012 (21:30). Radio-host Melvyn Bragg and his guests Saul David (Professor of War Studies at the University of Buckingham), Hew Strachan (Chichele Professor of the History of War at the University of Oxford), and Beatrice Heuser (Professor of International Relations at the University of Reading), discuss On War, a treatise on the theory and practice of warfare written by the Prussian soldier and intellectual Carl von Clausewitz. First published in 1832, Clausewitz's magnum opus is commonly regarded as the most important book about military theory ever written. Informed by its author's experience of fighting against the mighty armies of Napoleon, the work looks not just at the practicalities of warfare, but offers a subtle philosophical analysis of the nature of war and its relationship with politics. Notions such as the Clausewitzian Trinity have had an enormous effect on later military leaders. But its influence is felt today not just on the battlefield but also in politics and business. 26. 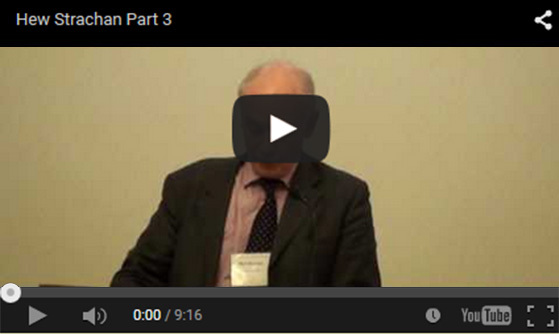 Hew Strachan: "Clausewitz and the First World War," Parts 1 through 5. 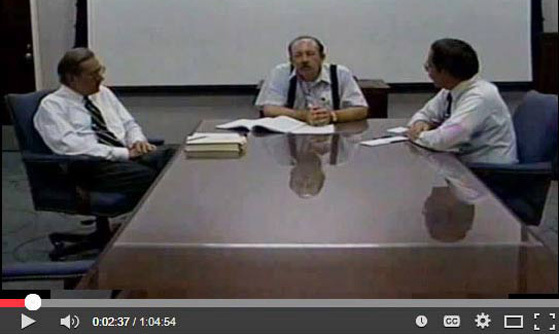 (These videos are daisy-chained together, so you can watch them in sequence. Unfortunately, the link to Part 6 is broken and we cannot locate it.) Scottish professor Hew Strachan is one of the strongest voices in the modern debate over Clausewitz—and largely positive in his views. 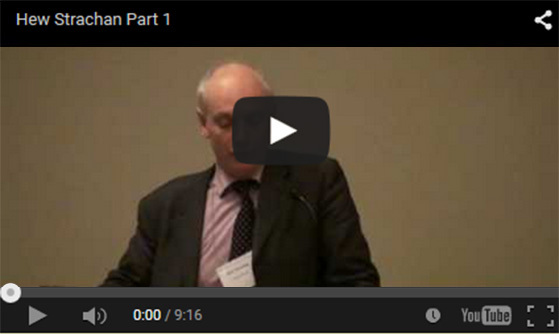 This is the 2010 George C. Marshall Lecture in Military History. 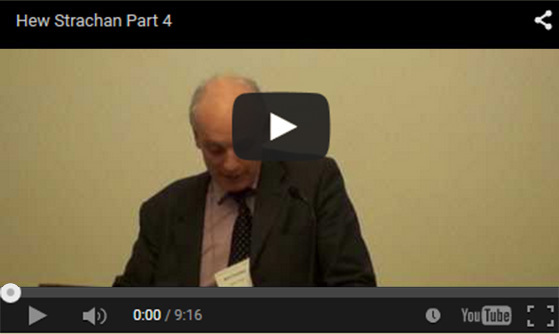 The History News Network recorded this video of Strachan (Chichele Professor of the History of War at Oxford University) speaking at the annual meeting of the Organization of American Historians on April 9, 2010 in Washington, D.C. See also the written article: Hew Strachan, "Clausewitz and the First World War," Journal of Military History, Vol.75, Issue 2 (April 2011), pp.367-391. That article is posted to The Clausewitz Homepage with the permission of The Journal of Military History. 27. AVAILABLE AT COST: Carl Philipp Gottfried von Clausewitz. (4:01) (In German.) From HISTOCLIPS. Free version no longer accessible, for commercial reasons. 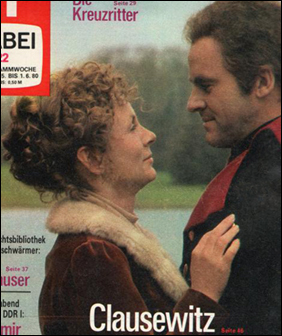 This video appears to be based on the made-for-TV documentary, "Clausewitz—Lebensbild eines preußischen Generals," made in the DDR (East Germany) in 1980. The Clausewitz Society in Burg bei Magdeburg recently (2016) held a public screening. See news story. 28. 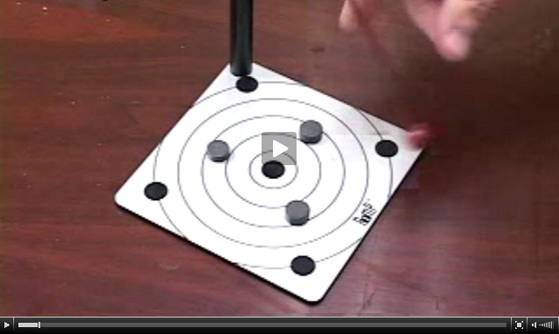 ROMP (Randomly Oscillating Magnetic Pendulum). The ROMP is a classic example of deterministic chaos. Clausewitz used this bit of science to illustrate his "fascinating trinity": "The task, therefore, is to keep our theory [of war] floating among these three tendencies, as among three points of attraction." This is actually a crucially important element to a modern understanding of Clausewitz. See Alan D. Beyerchen, "Clausewitz, Nonlinearity and the Unpredictability of War," International Security, 17:3 (Winter, 1992), pp. 59-90. 29. 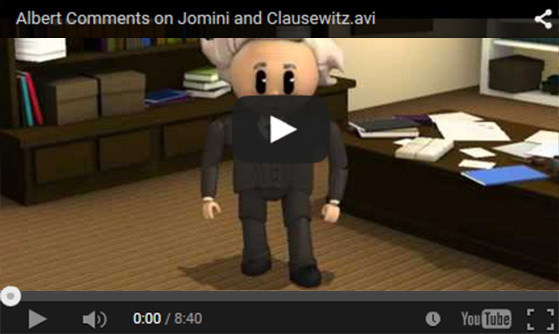 Albert Comments on Jomini and Clausewitz. Computer animation of Albert Einstein commenting on military theory and theorists. Slick and nicely done animation but the content is simplistic, with important factual errors, omissions, and a gross mispronunciation of "Clausewitz" (as "Clausewitch") throughout. Possibly aimed at elementary through junior high school students. We have no idea why people bother to make stuff like this. Please alert the Clausewitz Homepage editor if you are aware of any additional useful listings.